Leftover turkey is delicious in turkey pot pie, so I thought why not use it to make turkey pot pie soup? Hope you had a wonderful Thanksgiving and didn’t do too much damage to your waistline. I spent Thanksgiving at my Mom’s house, she wouldn’t have it any other way. She makes Thanksgiving look effortless, but we all brought some dishes along to contribute. I made a cauliflower gratin which turned out great, I’ll be posting that soon. And what to do with your leftover turkey? 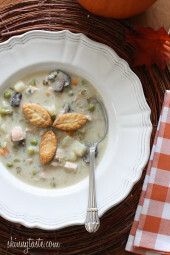 A turkey pot pie soup is comforting and a great way to use your leftover turkey. I made my own turkey stock from the turkey bones and some vegetables, but you can use canned, or even chicken broth. I took some extra pie crust I had and cut out shapes with a cookie cutter, then baked them to make little pie crust croutons, completely optional but I loved it. Create a slurry by combining 1/2 cup of the cold broth with flour in a medium bowl and whisk until well blended. Set aside. Pour remaining broth and milk into a large pot and slowly bring to a boil. Add celery, onion, mushrooms, parsley, fresh pepper, frozen vegetables, boullion and return to a boil. Partially cover and simmer on low until vegetables are soft, about 20 minutes. Remove lid, add potatoes and cook until soft, about 5 minutes. Add turkey, and slowly whisk in slurry, stirring well as you add. Cook another 2-3 minutes, until soup thickens, adjust salt and pepper to taste and serve.